(L to R) Mt Cran - Feared by the Bad, Delirium, Deep Purple, Monkey Puzzle. From Jamieson Saddle traverse the ridge, turning obstacles on the west side. In the upper Birch Hill Stream, follow the southern branch of the stream across tussock covered fans until a couloir leads up towards the peak. Ascend the couloir then angle onto the upper snow slope near the summit. Take the track beside Elbow Stream to the soil conservation experimental area then ascend the slopes to Mt Lloyd 2195m. From Mt Lloyd follow the ridge or sidle across to the saddle and climb up the final slopes to Mt Cran. A vehicle track follows Freds Stream for 2.5 km, then gain height until reaching the last sub-alpine vegetation. Choose a route either: to the saddle between Mt Lloyd and Mt Cran; or follow the snowy gully to the west of the summit; or to the west of Mt Cran towards Peak 2276 and then to the summit. On the left side of the south face are five obvious ribs. This route takes the central rib. Start left side of first overhangs, then follow crest. Move to left at top. 300m, crux grade 14, some splintered rock in places. The left side of the South Face of Mt Cran is comprised of a number of buttresses divided by deep cut gullies. Delirium ascends the relatively shallow gully in centre of face and is noticeable for its even angle. There is a short mixed crux at the top of the 300m route. Ascend the central rock buttress to finish 40 m right of the summit of Mt Cran. The first two pitches pass just left of overhangs (grade 14). Gain sharply defined crest and follow to top of buttress. 450m of 'make you think' climbing. A further 250m of easy angle terrain to the summit. A 250 m climb on the right hand buttress below east shoulder of Mt Cran. The first pitch is steepish when climbed direct. Then up centre of buttress on mostly sound juggy rock at about grade 12. 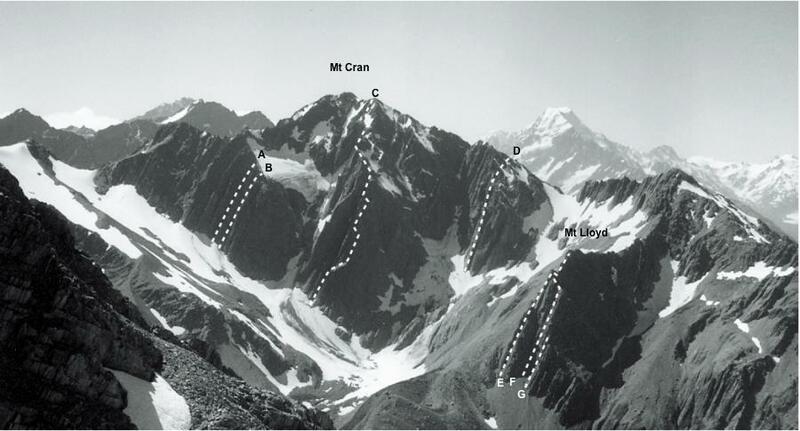 The west face of Mt Cran appears climbable by following the tributary of the Dobson directly to the western slopes and from there to the summit.